Runestone near Gripsholm Castle in Mariefred, Södermanland. 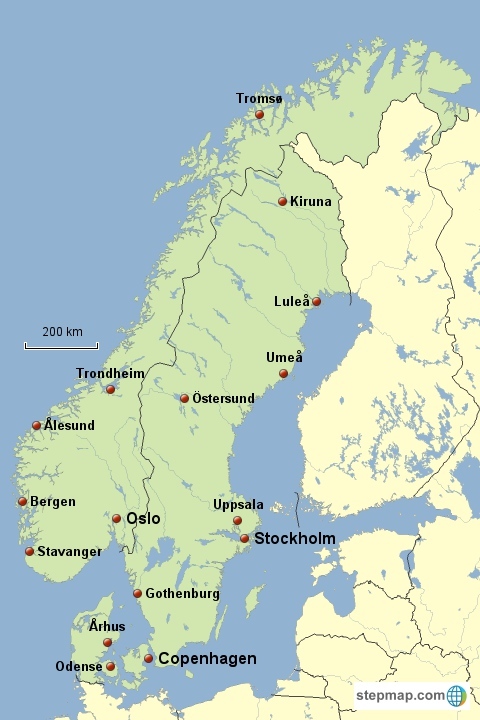 Remnants of Scandinavia’s Viking past are scattered throughout the countryside of Sweden, Norway, and Denmark. Among the most intriguing are the stones covered in Viking runes that give a glimpse of the culture and society of the era. According to the Swedish National Heritage Board, there are about 7,000 runic inscriptions in the world, of which roughly half are Viking Age runestones. Runestones were most commonly raised as memorials to deceased relatives and friends, but they were not burial markers. Instead they were often placed close to roads or other communication routes. The first runestones were raised in Sweden and Norway as early as the third or fourth century A.D., but most were raised during the later Viking period in the 10th and 11th centuries. Runestones are the oldest existing original works of writing in Scandinavia. Originally they were written in a script consisting of 24 characters, known as the Elder Futhark (f-u-th-a-r-k being the sounds represented by the first six characters). Beginning in the early eighth century, this writing system was replaced by a revised alphabet, known as the Younger Futhark, with just 16 characters. Most of the runestones found in Scandinavia use the Younger Futhark. Although the standard version of this alphabet is the one typically used on runestones, there is also a variation of the Younger Futhark called short-twig runes that was used for everyday messages carved on wood. 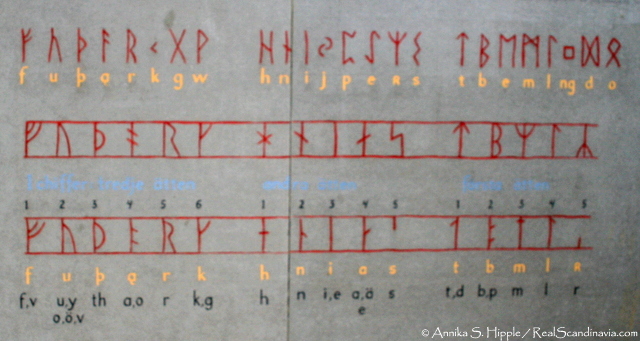 The three versions of Scandinavian runic script, from an information panel at the Rök Stone. Top: The Elder Futhark. Middle: The Younger Futhark, standard version. Bottom: Short-twig version of the Younger Futhark. 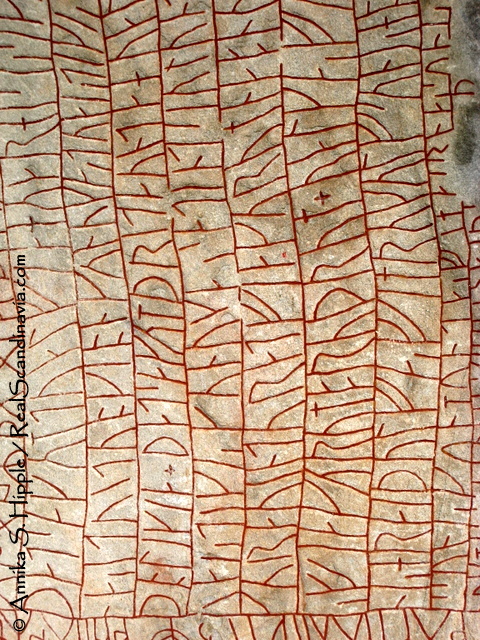 Rökstenen in Östergötland, with the longest known runic inscription. Runes cover all sides of the stone. Of the three Scandinavian countries, Sweden has by far the most runestones, with as many as 2,500 surviving to the present day (some estimates are even higher). 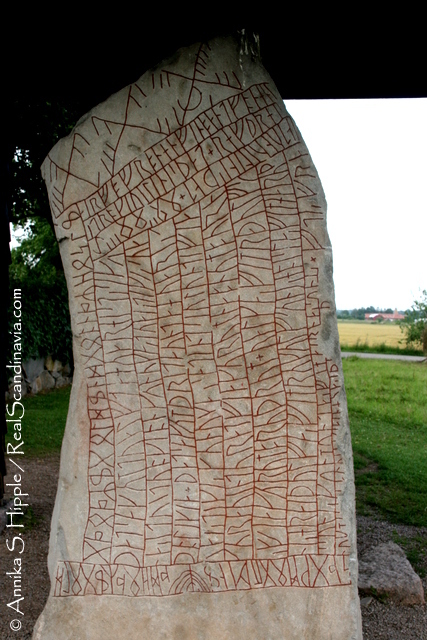 The longest known runic inscription (nearly 800 characters) is found on Rökstenen (the Rök Stone) in Östergötland. Raised in the ninth century A.D., Rökstenen’s text begins: “In memory of Vämod stand these runes / But Varin wrote them, in memory of his dead son….” Runestones have been found all over southern and central Sweden, but the greatest concentration is in the area surrounding Lake Mälaren, with Uppland having the largest number, followed by Södermanland. Many runestones still stand where they were apparently originally raised, although others have been moved to new locations. There is even a runestone set in the foundation of a house at the intersection of Kåkbrinken and Prästgatan in Stockholm’s Old Town, the stone having been reused as building material in an age when its archaeological value was less recognized than it is today. 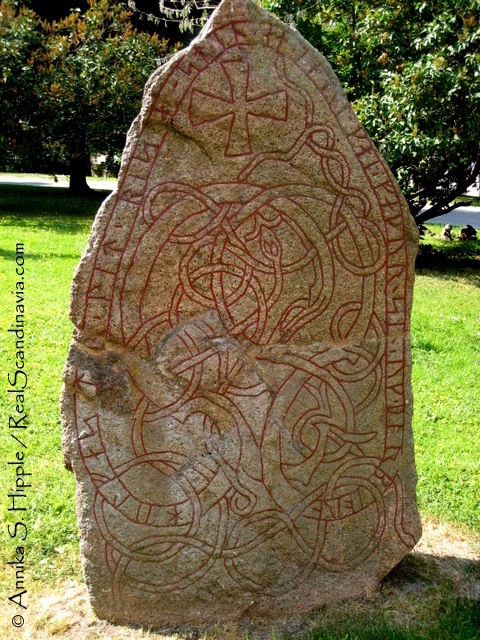 Denmark has about 250 runestones, including two stones raised at Jelling on the Jutland peninsula by Denmark’s first recognized king, Gorm the Old (reigned circa 936 to 958 A.D.), and his son and successor, Harald Bluetooth (reigned circa 958 to 986 A.D.). King Gorm’s stone honors his wife, Thyra, while the larger stone raised by King Harald not only stands as a memorial to his parents but also attests to the conversion of the Danish people to Christianity during Harald’s reign. The stones, along with the adjacent church and burial mounds at Jelling, are considered of such outstanding historical value that they have been inscribed on UNESCO’s World Heritage List. Runestone in Uppsala in Uppland. Norway has the fewest runestones, about 50 to 100 (some estimates are higher, depending on the criteria used). Among the most significant Norwegian runestones is the Kuli Stone displayed at the Norwegian University of Science and Technology’s Museum of Natural History and Archaeology in Trondheim. This stone is unique in that its text includes the first known mention of Norway – “Nóregi” – as a country and also includes a reference to the establishment of Christianity in Norway. The stone was originally raised on the island of Kuløy near Kristiansund on the northwest coast of Norway. Brought to the museum in 1913, it was recently added to UNESCO’s Memory of the World list, which recognizes documents of international historic significance. With the introduction of Christianity to Scandinavia came the Latin alphabet used today, although runes continued to appear in many places, from church doors to everyday objects, through the Middle Ages (and even beyond in places such as Gotland and Dalarna). Examples of this can be seen in locations throughout Scandinavia. From the information panel from the Rok stone I cannot make out the Younger Futhark, standard version letters under the runes. They are in a light blue that does not show up very well on the internet. Could you please email them to me in a darker version. Sorry for the delayed response. The pale blue lettering you are referring to is actually not a standard version of the Younger Futhark. It simply reads “I chiffer tredje ätten/andra ätten/första ätten” (“In ciphers the third aett/the second aett/the first aett”), referring to the groupings of runes (known as aettir) that — along with the positions indicated by the numbers — could be used to write alternate, coded versions of the runes. The standard version letters for the Younger Futhark are the same as for the Elder Futhark. As you can see, both sets of runes have the same number of characters in each aett. I am interested in learning more about the runes and how you know so much about them as I am learning to read the inscriptions as well. Would greatly appreciate hearing back; thanks so much. Thanks for checking out this article. I am not an expert on runes. Much of the information about Rökstenen, including the translation of the runes, is adapted from the information panels at the site. I have also visited many other runestones in Sweden; many of them are also accompanied by signs with translations of the runes and background on the stones. 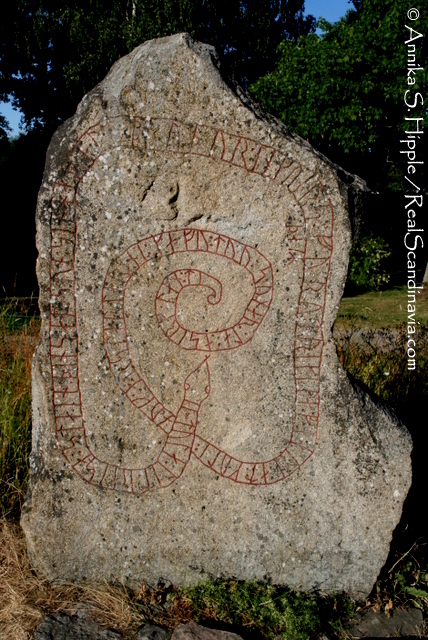 The information on the runic alphabets, the numbers of runestones found in each of the Scandinavian countries, and important Norwegian and Danish stones comes from research I conducted online in order to write this article. Among the websites I consulted were those of the Swedish National Heritage Board (Riksantikvariesämbetet) and the Historical Museum (Historiska museet) in Stockholm. Both have good pages about runic writing, but unless you can read Swedish they won’t help you, as they are not translated on the English portions of the websites. You should be able to find quite a lot of English-language information about runes and how to read them through Internet searches, though. Good luck! Hi I’m doing a report on Viking rune stones and this website was very helpful and i need to cite it. Would you be bale to tell me the date it was published and the full name of who ever wrote it? I’m so glad you found this website useful. Unless otherwise noted, everything on this website is written and photographed by me. This article was most recently updated on April 3, 2013.